Notes: It's not often that I knit a pattern twice, so it's a testament to how much I like this design that I started knitting it again right after finishing the first. For this version, I knit it at 4st/in to fit my daughter. On the body, I did not do any decreases for the waist or for the ribbing section, but I did do increases after the ribbing. 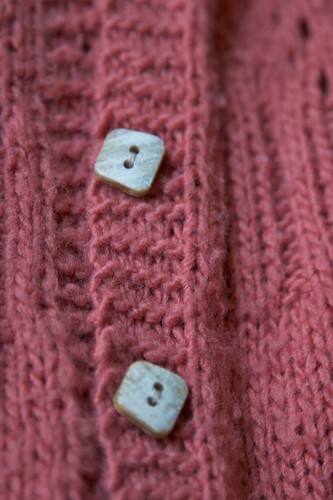 I did about 10 extra rows at the bottom (because of the significant row gauge differences) and added an extra buttonhole. Otherwise, I pretty much did the same things I had done on the version of this that I had made to fit myself. The yarn is extra soft and cushy (my daughter’s skin is really sensitive, and she just loves it), yet also very light. I did have a knot or two in every ball, though, and that was a big drawback. It also tends to fuzz up pretty quickly, but that’s nothing a shaver can’t take care of.